Both the magical and No-Maj communities are all a-buzz this month with what feels like daily announcements regarding the upcoming film, Fantastic Beasts and Where to Find Them. A huge boost to the movie hype is the Potter franchise’s online presence. From Pottermore to fan-made Tumblr sites, Rowling’s Wizarding World is at every corner of the web, so it shouldn’t be a surprise that the new film has several social media accounts at it’s back. What is a bit of a shock is just how long these accounts have been active without any of us knowing about it. 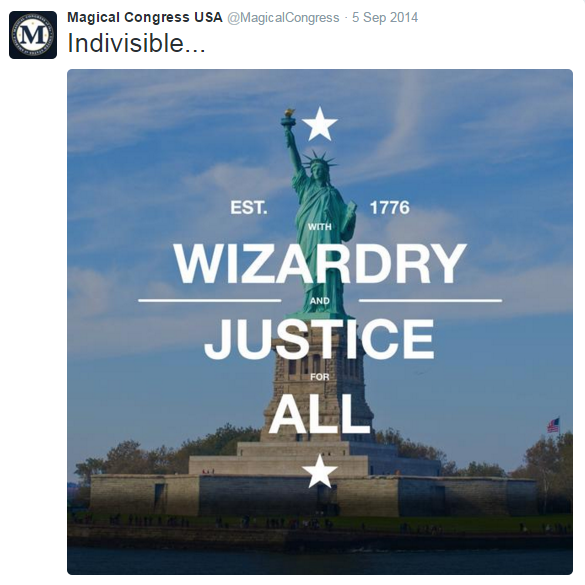 The Magical Congress of the United States (MACUSA) Twitter page has been tweeting about all things wizardry since March of 2013, and the page was created way back in 2011! Um, how did we not know about this? 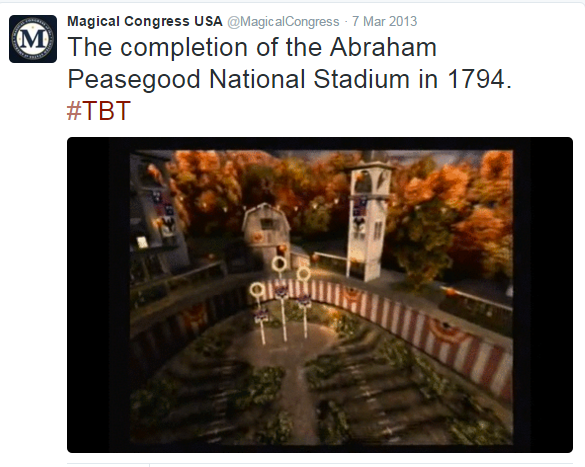 That, fellow fans, is a still shot from the 2003 Harry Potter: Quidditch World Cup video game, and yes that is the playable American Quidditch stadium in the game. Did I recognize it immediately? Absolutely. No shame, here. 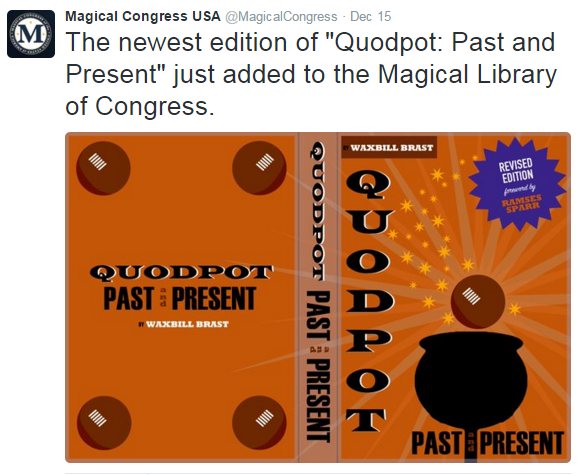 Quodpot is quite simply a variant of Quidditch created by Abraham Peasegood in the 18th century. If you’re interested in learning more, maybe plan a visit to the magical library nearest you. As a powerful auror and the right-hand man of the American wizarding world’s president, I’m sure Graves could really relate to the happenings on this show. The American Quidditch team didn’t make it to the final in the 2014 World Cup, but MACUSA made sure to include the team’s seeker in their coverage. 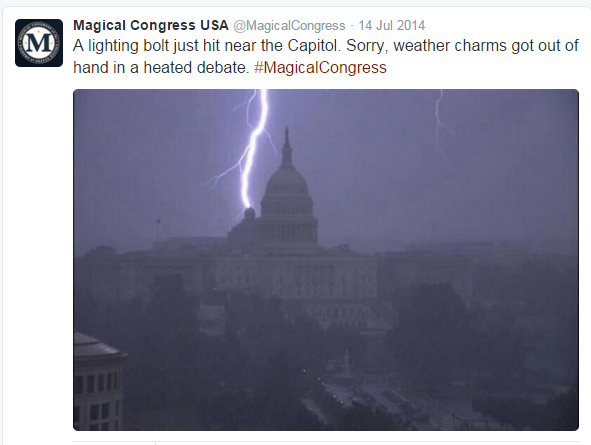 When a lightning bolt very nearly hit the U.S. Capitol building, MACUSA was on the scene to share their apologies for the close call. Good to know that wizards and witches of the world have our backs when the WiFi goes down. Keeping things civil between magical and non-magical folk isn’t all fun and games, but I’m glad to see that through it all, our leadership is capable of a light heart. Keep on making us chuckle, MACUSA, you’re doing a grand job. Yearning for more Twitter wizardry? You can also follow President Quahog himself, as well as Darius Smackhammer and the official Fantastic Beasts page.